Supporting conservation-related research at Reserva Las Gralarias is one of the core goals of the Las Gralarias Foundation. 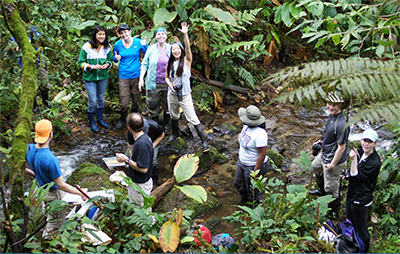 While projects are diverse, they all share a common goal of enhancing knowledge and conservation of the species who inhabit this sensitive cloud forest ecosystem. Many projects have resulted in exciting discoveries of new species. 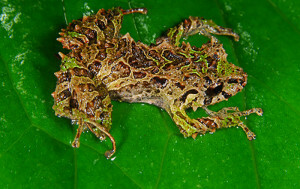 These include the Las Gralarias Glassfrog, Nymphargus lasgralarias (Hutter and Guayasamin 2012), the famous shape-shifting frog affectionately nick-named “The Punkrocker,” Pristimantis mutabilis (Guayasamin et al 2015), and two moth species, Hynhamia lasgralariae and Dimorphopalpa lyonsae, one named for the preserve and the other for RLG owner Jane Lyons (Razowski and Pelz 2007). Other projects have helped expand knowledge about the ecosystem of Reserva Las Gralarias. We have teamed up with Professor Eric Snyder and students enrolled in his Tropical Ecology and Conservation course offered at Michigan’s Grand Valley State University (USA) in an on-going, bi-annual study to conduct long-term water quality monitoring and aquatic invertebrate surveys. Additionally, staff from Ecuador’s National Herbarium have surveyed the plant communities at RLG, discovering the critically endangered Podandrogyne brevipedunculata in relative high abundance at the reserve. A multitude of behavioral studies of RLG fauna have been completed as well, including the courtship behaviors of an endangered glassfrog, Centrolene peristictum (Dautel et al 2011), the nest-building behavior of the Yellow-breasted Antpitta (nest found by RLG’s very own Segundo Imba and described by Greeney et al 2010), and the nocturnal behavior of mammals (Bartzke et al 2008; see the trail camera gallery for photos). Those interested in conducting conservation-based research at RLG should contact Dr. Katherine Krynak at kkrynak@gmail.com for application materials and general information regarding required permits. To view a list of publications based on research at Reserva Las Gralarias, click here. For a PDF version of the publication list, click here. The Las Gralarias Foundation is a 501(3)(c) organization, and all contributions are tax-deductible. You can donate to LGF through Paypal or send a contribution to our mailing address shown at the bottom of this page. the possibility of spotting something rare and wonderful at Reserva Las Gralarias. the amazingly adaptive (and cute too!) Anole.